Examples: Renaissance paintings; Pilgrim’s Progress; Animal Farm; The Seventh Seal. The Belko Experiment. Mother!‘s main metaphor is this: Mother is Mother Nature and Him is God. The house? Earth. Etc. It’s a symbolic representation of human history ending in disaster. Cyclical, not final. Not necessarily our history, our story, but it might be, could be our story. A cautionary tale. Mother! mines most of its material from the Bible, but reflected in the mirror darkly mind of Darren Aronofsky. Mother! is like a dream, a dream written by Carl Gustav Jung. Mother! is like a Greek myth, in the sense that myths about Gods and demi-gods represent views of human vices and virtues. Mother! cannot and should not be reduced to one, simple allegory and cautionary tale about human mistreatment of Mother Earth, even if that’s how Aronofsky wants us to read it. However, taken as just such a metaphor, Mother! moved me to tears (just as I was moved to laugh many times earlier in the film). 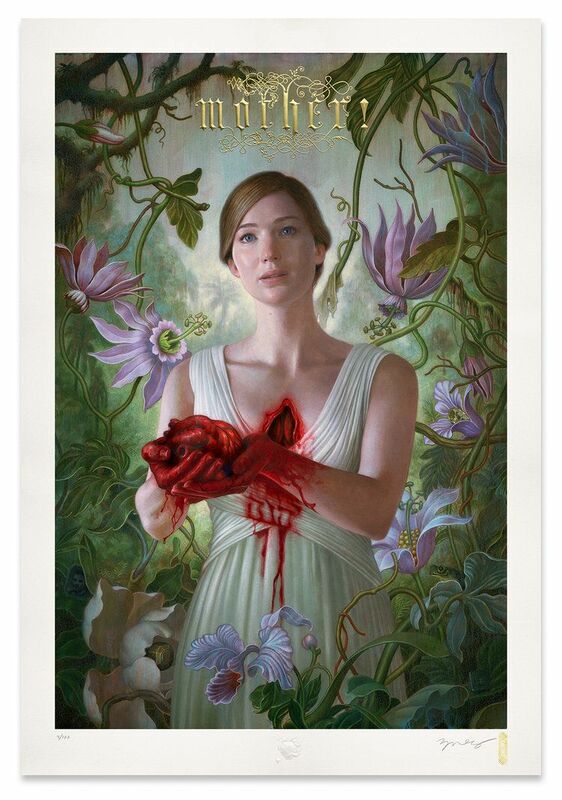 Mother (Jennifer Lawrence) is as much an artist as Him (Javier Bardem). However, she’s introverted and private; he’s extroverted. An odd couple story about a couple living out archetypes. What’s the fluid Mother drinks? Birth control? Other precedents: Ulysses by James Joyce; Cocteau’s Orpheus; Fellini’s Juliet of the Spirits. A great example of POV storytelling. Hitch would approve. The film is told almost entirely from Mother’s POV. We empathize with her and see everything happening through her. Is it too much to say we cling to Mother as if connected to her by an umbilical cord. And when the end comes and we lose that POV, it’s as if our umbilical cord has been cut and there’s a great sense of loss. There is a long history of melodramatic deathbed mother scenes in films. This is not one because along with the feeling of loss there is also a feeling of guilt. Guilt because we did not do enough to save Mother. We were right there with her, right up till the end, yet we could not save her. At least not this time. Maybe next time. You know those crazy fan theories about Kubrick’s The Shining? Was Aronofsky influenced by that phenomena (which, of course, isn’t confined to The Shining) and made a film for fans to theorize about. Not a shaggy-dog film, but a film where the fan theory is legit and fits because it’s the director’s theory. Sadly, most reactions to the film seem to want to prove true the film’s dark vision of humanity, but this dark vision of humanity is already there in the Bible. In fact, the Bible’s vision is darker. The reactions to this film would probably not have been much different had the film been marketed differently. The studio probably knew exactly what they were doing, and they knew how difficult it would be to market a film like this that cannot be placed in a simple genre category. Sadly, it proves, once again, that studios alone are not to blame for the films we get. Audiences (and even some critics) must share some, if not most, of the blame. I salute Paramount, specifically whoever it was that gave this project the green light. They made me happy, and now, they can die happy. Tagged with Darren Aronofsky, Mother!